Libel is a legal term that refers to the making of false and malicious statements about a person in some type of print or writing. This can include false and malicious statements made in writing, printed on signs, or published on a public forum. Publishing defamatory statements or pictures through the media is also considered libel. To explore this concept, consider the following libel definition. Noun. The defamation of a person’s character by written or printed words or pictures. Noun. The act of publishing defamatory statements or pictures, or in any form other than spoken words or gestures. Verb. To make untrue, damaging statements as fact or truth, rather than opinion. Libel is one form of defamation, which is the damaging of someone’s good reputation or character. When someone makes a disparaging or derogatory statement about someone in print, or through signs or pictures, it is considered to be libel, which is against the law. In order to be considered libel, a statement must be untrue, as everyone has a right to speak truth about other people. Additionally, people have a right to speak their opinions. Both libel and slander are forms of defamation of character, differing only in the way the person making the damaging remarks goes about it. 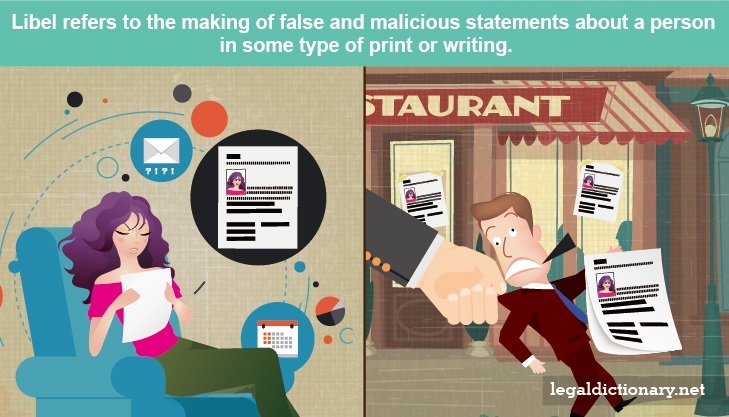 While libel refers to making false and malicious statements in print, or publishing or posting damaging pictures, slander refers to the making of damaging remarks verbally. Because libel and slander are different forms of the same wrong, which is defamation, the laws and remedies are pretty much the same. One primary difference between the two as far as the law is concerned, is the ability to prove that the defamation actually occurred. Libel can easily be proven, as it involves written remarks, or published pictures. Slander requires proof beyond he-said/she-said in court. Proving slander would require bringing witnesses, usually the people to whom the damaging statements were made. In some states, recordings of the accused person making the defamatory statements to others may be allowed in court, depending on the circumstances of how the recording was obtained. Mary tells her co-workers that Brad, another co-worker, got drunk at a corporate meeting out of town, and was asked to leave. The statements made their way back to the company president, who fired Brad for unprofessional behavior. Brad claims the statements were not true, and files a civil lawsuit against Mary for defamation of character, which caused him to lose his job. In court, Mary denies making any untrue statements to anyone, and Brad is unable to find even a single person who is willing to testify to Mary telling them anything about Brad or his behavior. Lacking proof that Mary slandered him, Brad cannot win his case. If, on the other hand, Mary had sent out an email with her claims, and had Brad been able to obtain even one copy of that email, Mary might be on the hook for a libel case. The same would be the case had she published the statements on Twitter or Facebook. This assumes, however, that Brad can prove the statements were actually false. There are some people who are in the public spotlight, who must endure the opinions and publications of the public, largely without recourse. Statements made about people such as government officials, political candidates, celebrities, sports players, and authors, are usually exempt from claims defamation, whether the claims are libelous or slanderous. This is true even if the statements, or pictures, are untrue and damaging. If, however, untrue statements are made about such a public person with malice, or with hate and a desire to cause harm with no regard for the truth, the public person may have a right to bring a civil lawsuit. Sebastian is a local plumbing contractor running for city council. Nancy had a bad experience with Sebastian a couple of years ago, and simply cannot support his bid for office. Nancy wrote a letter to the local newspaper of the problems she had when Sebastian plumbed her new bathroom, stating she felt he had been dishonest in his dealings with her. Sebastian becomes angry and tries to get the newspaper to retract the statement, which was published on its Election News page. The newspaper refuses to remove the statement, so he tries to get Nancy to retract her statement, threatening her with a libel lawsuit. In this situation, Nancy’s publication of her opinion that Sebastian was dishonest is just that – her opinion, which she backed up with an account of her experience. In addition, because the statements were made about Sebastian in his role as a political candidate, he would have to prove that Nancy’s statements were not only untrue, but that they were made with malice. Some states recognize libel as criminal defamation, considering it a breach of the peace. Penalties for criminal defamation in those states may include fines, restitution, public service, and perhaps jail time. By far, libel and slander are considered to be civil tortes, allowing for a victim to file a civil lawsuit requesting damages. In the U.S., a lawsuit for defamation, whether libel or slander, may be brought in either civil court, or in small claims court. The appropriate court to hear the matter depends on the amount of damages sought. If the plaintiff is seeking an award within the limits of the small claims court in his jurisdiction, his case should be filed there. If he is seeking a large amount of money as compensation for his damages, the case must be filed in the civil court. Truth – In most jurisdictions, the plaintiff in a defamation case must prove that the statements made about him were false. In jurisdictions that do not require this proof to be made, the defendant may prove that the statements were true, at least in large part, as a defense. Consent – If the defendant can prove that the plaintiff consented to publication of the information or statements, it may serve as a defense. Absolute Privilege – In some situations, a person making defamatory statements may claim privilege as a defense. This works as an immunity to liability, usually granted by law to certain circumstances or proceedings. These include statements made in legislative or judicial proceedings, statements made between spouses, and statements or publications made as required by law. Conditional Privilege – Immunity or privilege may also stem from the occasion on which the statements were made. The defendant must prove that he was entitled to such a privilege, and that he believed that the statement was true. Conditional privileges may include statements made in protection of the public’s interests, statements made to ensure the well-being of a family member. In March 1960, the New York Times published an advertisement titled “Heed Their Rising Voices,” which solicited donations for the defense of Martin Luther King, Jr. The civil rights activist was facing charges of perjury in an Alabama state court. The published ad described actions taken against civil rights protesters, as well as actions taken against King. Some of the actions were described inaccurately, though none of the inaccuracies were serious. The Montgomery Public Safety Commissioner was not mentioned by name, but he felt that criticism of the actions of police to be defamatory to him personally. Public officers at the time could not seek damages for libel unless they had demanded, and been denied, a public retraction of the statement. When the Times refused to retract its statements, the Commissioner sued the Times, as well as the four ministers mentioned in the ad. The Commissioner won his case, and was awarded $500,000. “[T]he First Amendment protects the publication of all statements, even false ones, about the conduct of public officials except when statements are made with actual malice (with knowledge that they are false or in reckless disregard of their truth or falsity). Remedy – The enforcement of a right, or imposition of a penalty by a court of law. Special Damages – Damages awarded to compensate a plaintiff for quantifiable monetary damages, such as medical bills, repair costs, or lost earnings.